This morning I saw the FIRST CHICK. That is Dad Petruchio landing with a fish. The chick is sitting in front of Mom Kate. The chick is a spiky white fuzz ball with a shiny black beak, looking slightly to the right. I have enclosed 2 copies of the same photo because it can be hard to see chicks at this stage. 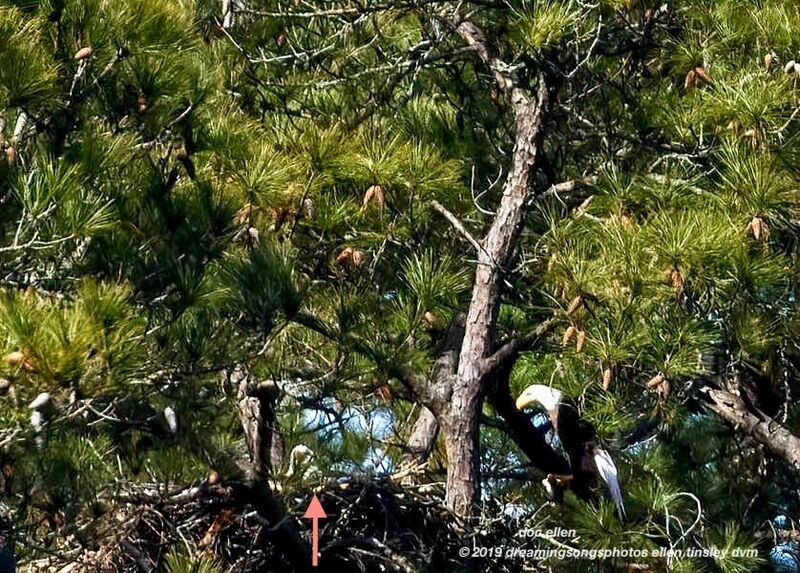 The red arrow in the second photo is pointing at the chick. The cove suddenly erupted in Mom Kate’s high pitched angry alarm calls. 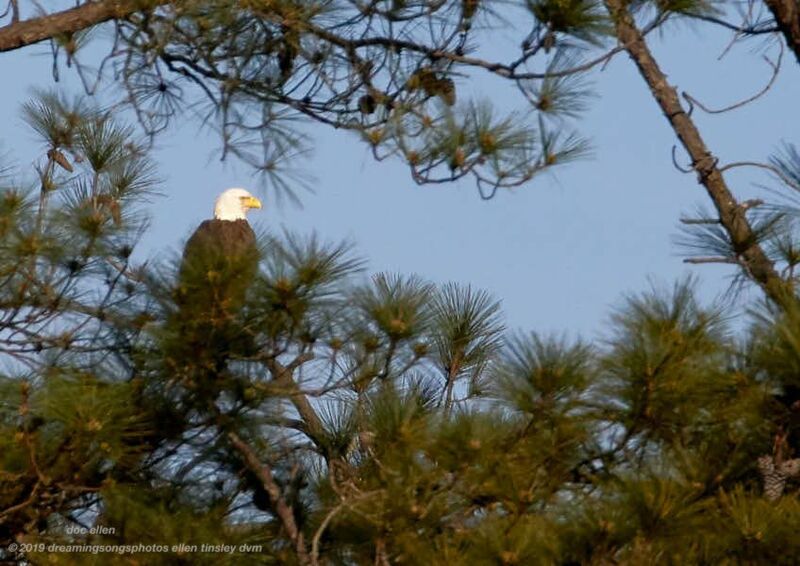 This time the intruder was another bald eagle. I looked toward the main lake and there was Petruchio making a high speed dash for home. Dad Petruchio had a fish for his family. 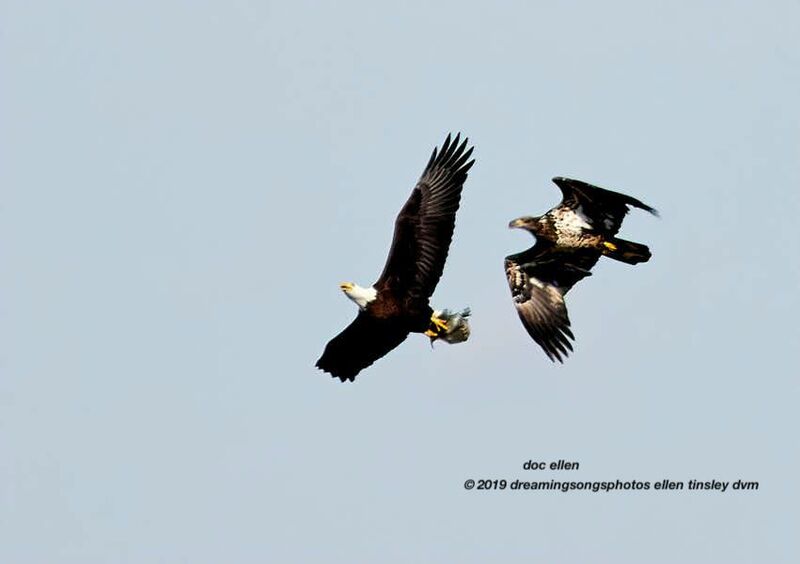 The two-year-old bald eagle wanted to steal the fish. The dash was on as both raced toward the nest. Eventually there were two two-year-olds and a three-year-old trying for the fish. Petruchio made it to the nest and the screams continued. Finally he and Kate stand side by side and watch the intruders fly out. 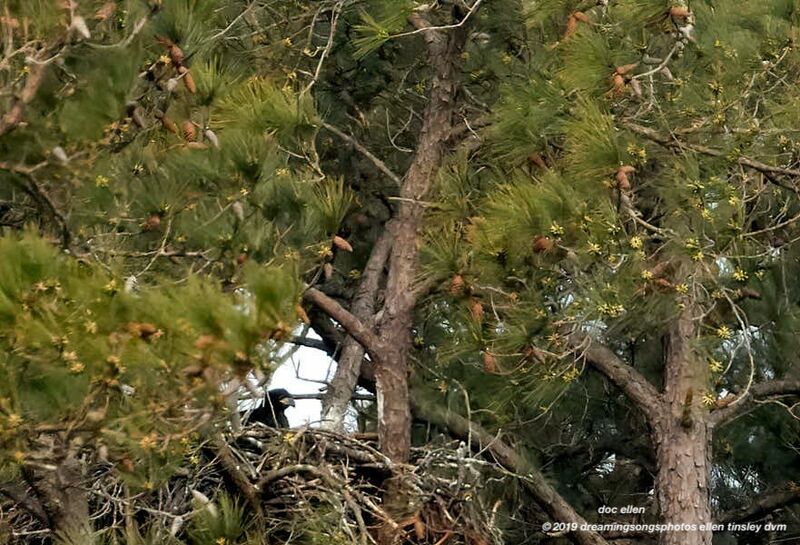 So far, the news is very good at the two nests that had human intrusions! Dad Petruchio bringing a fish to the nest this afternoon. Mom Kate on the left and Dad Petruchio on the right. 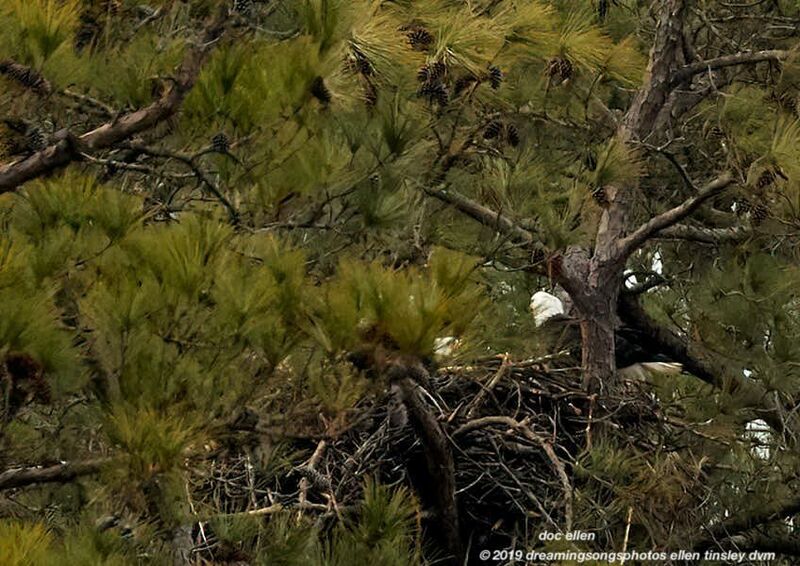 Kinda hard to see Kate – wind was blowing and she was staying tight on the chick(s). Mom Godiva hasn’t laid her eggs yet; that’s her on the right. Hershey seems to be singing a duet with her. 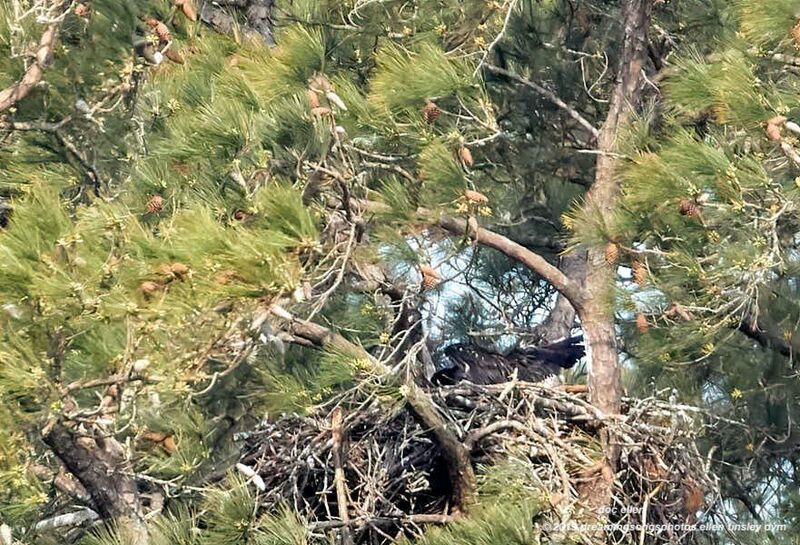 You can see the nest to their right. As always, this nest is the furthest reach for my camera. 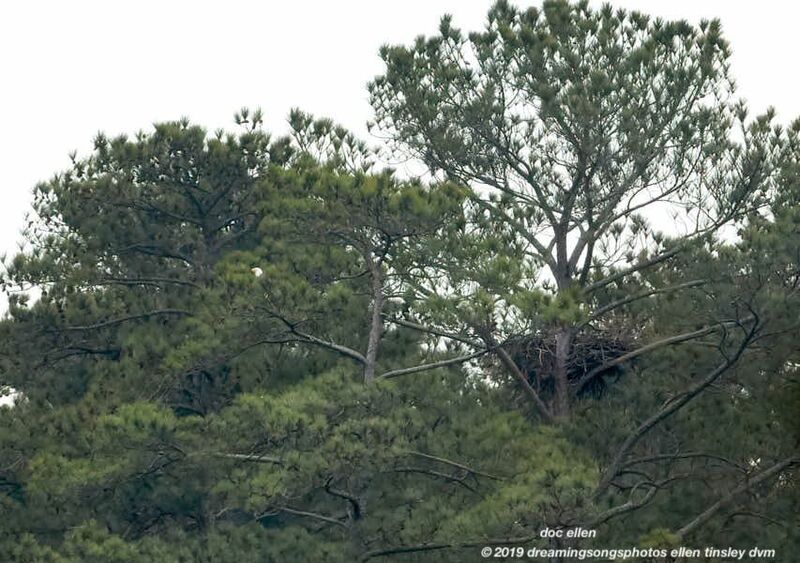 Thought I’d give you a wider view of the nest and the surrounding trees. Do you see Godiva too? 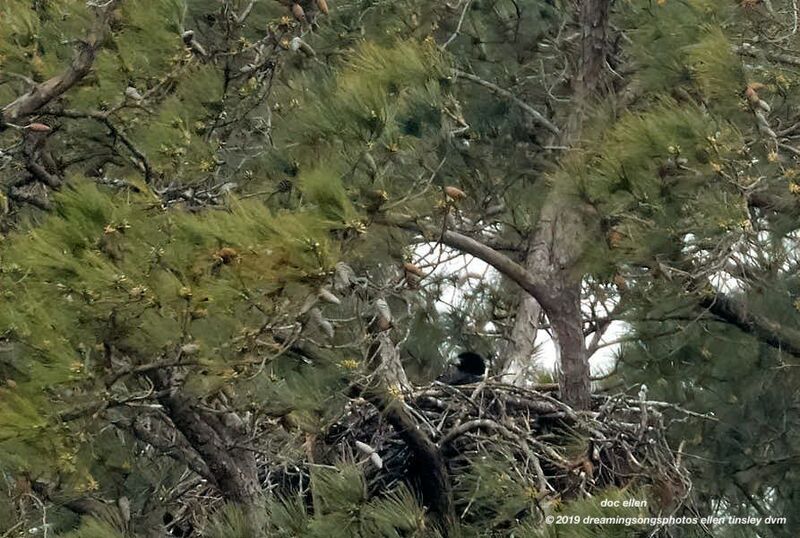 1) On Saturday a person was flying a drone and trying to get it into position to see into H&G Nest. Drones terrify bald eagle parents and they will literally abandon eggs and chicks if a drone is closer than at least a thousand feet for even a few seconds. 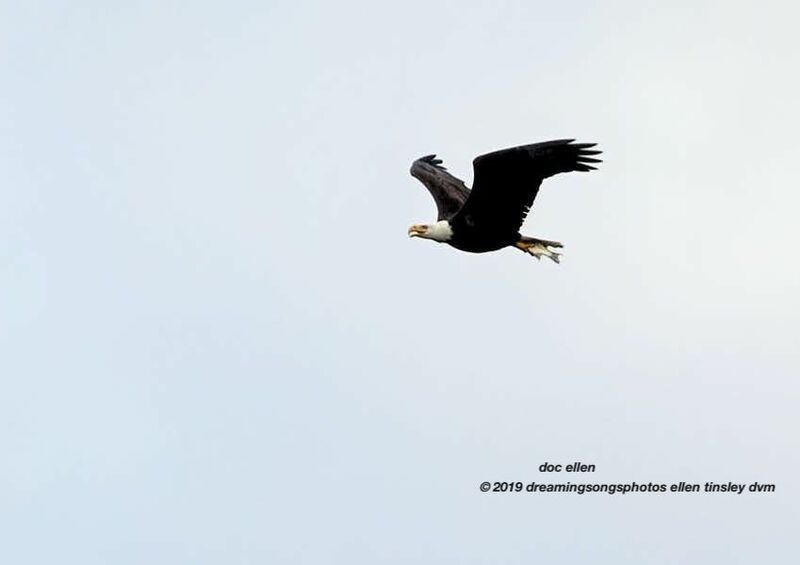 Non-breeding bald eagles have been known to attack drones – no eagle should have to tackle a drone. I have no concern or sympathy for the drone owner if their drone is destroyed but the real potential for damage to an eagle makes me angry. Also pass along the following information: recreational use of drones is FORBIDDEN at Jordan Lake Dam. The use of drones is FORBIDDEN at all Jordan Lake State Park facilities (ramps, beaches, campgrounds, etc.). 2) This morning I watched a human intruder wander the shoreline below First Nest. Dad Petruchio was on the nest when he saw the person. 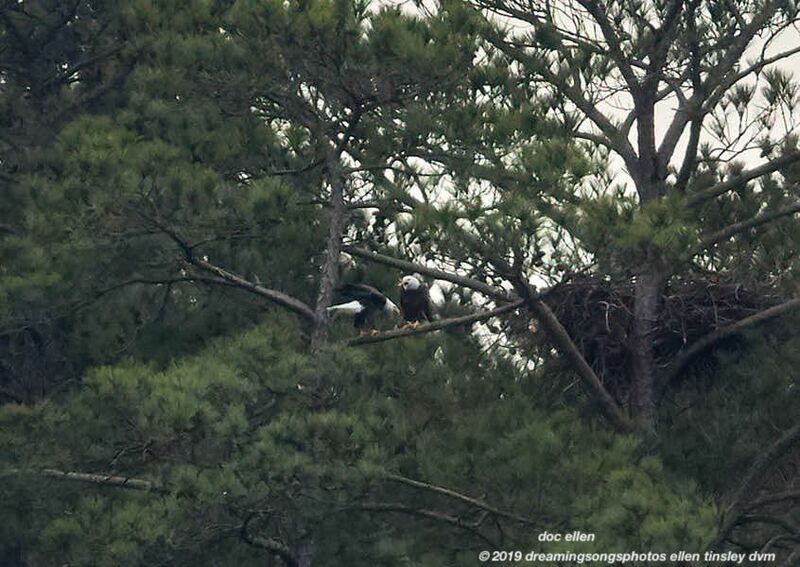 The father eagle teetered on the edge of the nest watching as the human got closer. When Petruchio could no longer stand the presence of the person, he bolted from the nest. Momma Kate came streaking in from midlake, but she turned back and bolted too. 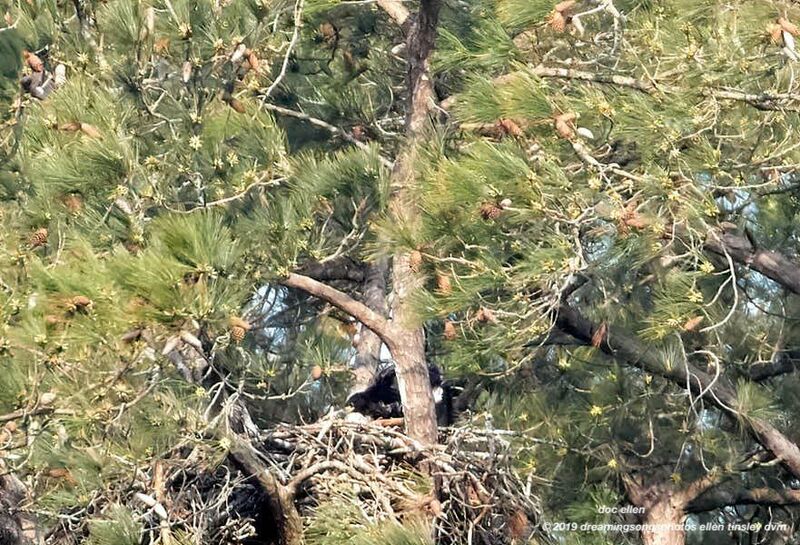 The chicks were without parents – and especially the warmth of those parents – for more than 1 hr 45 min. Twice both parents tried to approach their nest and twice both parents left. 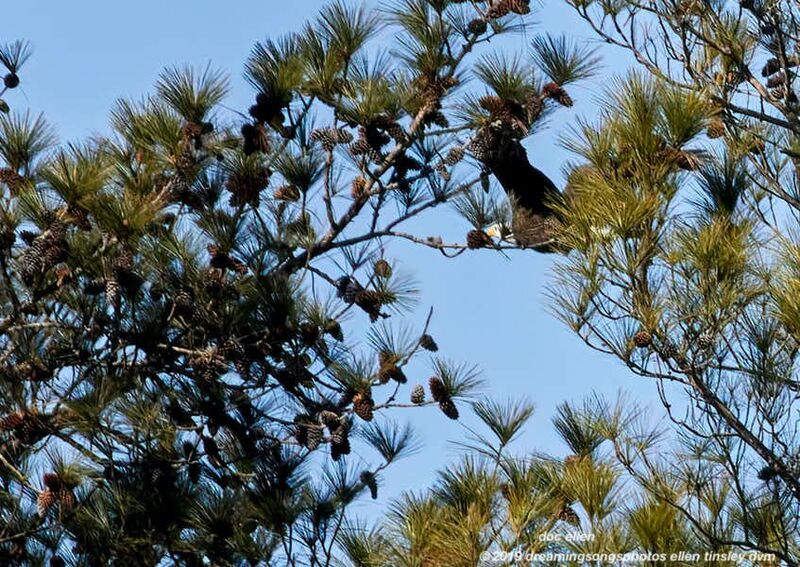 The Rangers came and explained to the intruder how his presence was endangering the bald eagle family. The man apologized. But, it was a long cold 155 minutes before Kate and Petruchio felt they could return to the nest. It will be a number of days before we will know if the chicks survived. 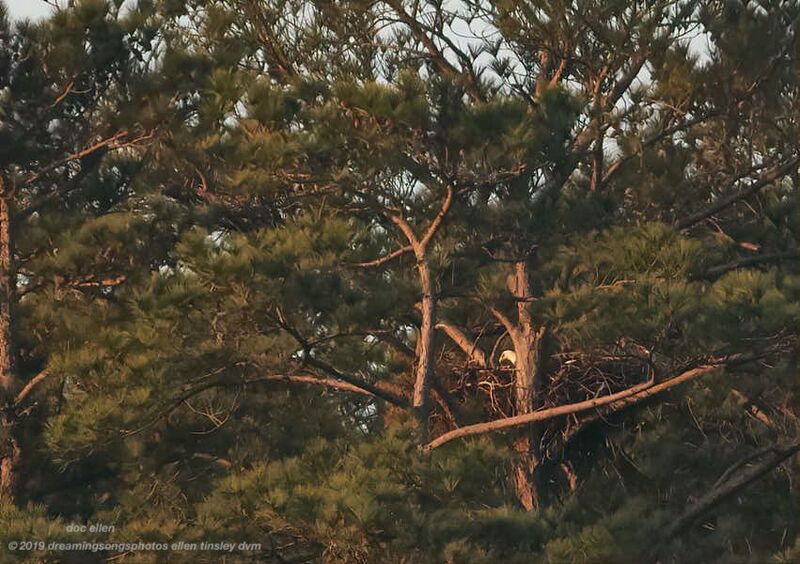 Photo below is Kate streaking back to the nest almost 2 hours after the human activity had stopped. Petruchio followed her into the nest a few seconds later.